"Over the minds of mortal man come many shadows...shadows of greed and hate...jealousy and fear. Darkness is the absence of light...so, in the sudden shadows which fog the minds of men and women are to be found the strange impulses which urge them on to their...venture in the dark." From out of the murk of a terrifying night come tales of the unexplained, the unfathomable, and the uncanny! 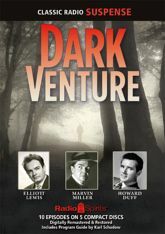 Howard Duff, William Conrad, Elliott Lewis, Jack Moyles, Marvin Miller, Lou Merrill, Betty Lou Gerson, and narrator John Lake take you on ten radio journeys into the darkest reaches of the human soul!